A puny 2.4% of print subscribers is the average number of people paying for online content at the handful of daily newspapers that have been bold enough to erect pay walls, according to a new survey. In the first comprehensive study of actual consumer willingness to pay for online news, ITZ/Belden Interactive delivered both good and bad tidings to publishers hoping to begin charging for their content. The bad news, of course, is the limited number of online readers who were willing to pay for online access to the 26 U.S. dailies included in the survey. The full survey is available here for $599. The study found that only two papers – the Key West (FL) Citizen and the Bloomington (IN) Herald Times – were able to sell online access to a number of subscribers equal to 4% or more of their print circulation. If you factor out those two outlying publications, the average online penetration of the remaining 24 papers – which together have more than 1 million print subscribers – is an anemic 2.1%. But wait, it gets worse. Because only about a third of American households subscribe to newspapers, the survey suggests that the actual average penetration of pay sites is at best 0.7% of total households. As for the good news in the study, publishers will be cheered to know there is “little to no correlation between price and uptake,” said Greg Harmon, the lead researcher for the project conducted in conjunction with the American Press Institute. Even though the Newport (RI) Daily News charges $420 annually for online access, its 1.7% penetration rate is identical to that of the Colorado Springs (CO) Gazette, which charges web subscribers only $1 a year. This suggests that publishers who start charging for access to their websites can ask pretty much anything they want. They evidently won’t get a lot of takers but that may not matter to publishers of small and medium papers facing scant competition in isolated markets. The story would be different, said Harmon, for metros and other papers that depend on lots of page views to generate online ad revenues. Any explanation for why Key West has such a high rate compared to the other newspapers? The 13 percent figure stands out in stark contrast to most. "Even though the Newport (RI) Daily News charges $420 annually for online access, its 1.7% penetration rate is identical to that of the Colorado Springs (CO) Gazette, which charges web subscribers only $1 a year." I'm honestly disappointed that a such a mis-representation could make it into this blog - especially one which is the basis for the far-reaching implications you assume based off of bad information. The Wall Street Journal charges, what (something like $225 per year?) for their annual online paper? Who in their right mind would pay DOUBLE that for a local paper. It doesn't make sense at all - and was immediately obvious, before I went to the website and observed that someone simply multiplied their monthly rate times twevle instead of checking thew actual rate. Again - I really like this blog about 99% of the time because is does present facts. This, however, is clearly and example of the other 1%. Interesting. Been watching Patch, a chain of web-based local news content, develop an edition in my town. It's an ad-supported revenue model. When I met the publisher I asked why they weren't charging the affluent, educated and presumably news-hungry residents for access to their presumably valuable content. His take: the war over paid vs free content has already been fought ... and lost. News sources that can't find a way to live with free as a business model are doomed. Not sure he's found that way either, though. 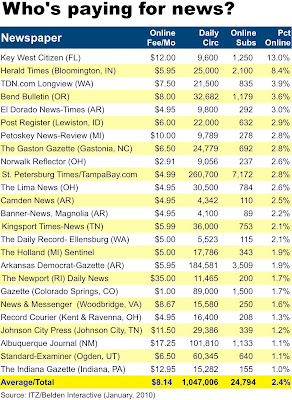 The online-only subscrition rate, anon, for the Newport Daily News is actually $345/year. $100/year if you also subscribe to the print product. I do remember the paper announcing the rate to be $420/year a while back. Perhaps they decided to cut the rate. Not sure what the second commentor was smoking (i want some!) as per the NDN, online subscription only is $345.00/ year. It's even on the link they posted!! Subscription prices aside, there isn't enough information here to be meaningful. What is the definition of "paid content"? Do we mean a standard newspaper web site that you can only access by paying? Are we talking about "e-editions" -- replica papers? Do potential subscribers have the choice of accessing some content for free? How much? I subscribed to a replica for three years because the carrier wouldn't come up the hill on snowy days. I found I preferred it to a paper version, but there was no difference in price. At that paper, there were others in remote areas subscribing on-line, but the dilemma was that those in truly remote areas couldn't get high-speed Internet either. Nonetheless, the replica was a true alternative to the print model -- every page reproduced and you leafed through as you would a printed copy. Is that what we're talking about here? Either we're talking about so many models that the study has no firm foundation and no conclusions can be drawn, or else we're talking about one particular model and haven't been told what it is. Either way, there's not much of value here. I think it's a bit misleading to simply compare the number of online only subscribers to print subscribers, and say paid sites have such limited buy-in from readers. Many newspapers with paid sites offer online access as one of the perks of a print subscription, not an additional charge. If that's the case, some of these papers are actually generating revenue from more readers than if they offered online access for free. Speaking of Patch, does it have any revenue? I've rarely, if ever, seen any ads on the myriad town-centered sites it has. I understand it's early in the process, but is anyone buying? For some of the smaller papers, maybe a pay wall is the best bet until they can figure out how to sell ad space. So much opinion. If every newspaper put a price on their content we would reckon with the inevitable. Pay or not read the news. Stop letting Yahoo! and Google et.al. get away with content robbery. I think a distinction between online news sites and electronic editions of newspapers would be helpful. Those have alwasy been paid, usually the same price as print. Even thought you still have to pay editorial costs to create the newspaper, you save sunbstantial distribution costs. There are some magazines who only have electronic editions, but not many (if any) newspapers. Just for the record, noticed this error in the chart: The Post Register is in Idaho Falls, Idaho -- not Lewiston. As one of the writers of this report, the blog misses the obvious. If a newspaper has 10,000 subscribers and 40% of them register for "free" online,that makes at least 42.4%. Put it this way, some subscribers may prefer the online access and start to consider that they get the newspaper for "free". My point is, the market size is obviously greater than 2.4%. It would be safer to say that given a choice between getting both the newspaper and online access, 2.4% choose not to receive a newspaper, 60% choose to only receive the newspaper and 40% chose to receive both, since, well, they can. The real point derived is only one of price elasticity. If people were very concerned about pricing, they would certainly cancel print for the (mostly) $3,94 to $5.95 a month version. Clearly there is a huge barrier between paying or not paying (hence all the print cancellations for free web access), but once the decision is made to go through the credit card process, well, price is not much of a barrier. At relatively low whole dollar rates, its more a question of to buy or not to buy, at all, whether its print or online. Its still just a paid service. Whether the consumer will buy depends on the importance of the information and the competition. Well, the total of 102.4% aside, I'm still wondering what they are willing to pay for -- a full e-edition or the right to click on headlines. Without that distinction, you might as well run an article on eating out that talks price without distinguishing between driving through McDonalds and sitting down at a full-service restaurant. If your conclusion is that people don't care about price, you can't lump in a Happy Meal with surf-and-turf or Coke with vintage wine. What were you comparing to what??? The overall statistics are not broken out by e-paper versus pay walls and partial pay walls in front of traditional html content, however the interviews and top 21 sites include all of the above. That is, in the top third of sites sampled, sites that do not post their material and force the e-paper buy sold about as many subscriptions as the sites that developed a full web site, and shut down some of it. Keep in mind, however, that the top third is almost all small sites. Again, lack of competition in the market and strength of franchise has a lot to do with whether a regressive strategy like e-paper-only sales will work, and I am not a fan of this strategy. On the other hand, whether to put the pay wall behind a headline, or a paragraph, or department heading or the third story viewed, is an art. If you want to really investigate the varieties, you should buy the report. But in general, the 2.4% is achievable from a number of different strategies from e-papers to a variety of pay wall models. The paper that I work for we have a rate of just over 4%. This is just for access to the site. The only free sections that we have are the classifieds, everything else is behind a paywall. I think that the reason that we do so well is that we are the ONLY source of local information in 3 counties. Financial Review in Australia has just over 9% and growth running at 53% pa.